Well, a lot has happened since the publication of that story. Artur Pawlowski (one of the Christians discriminated against) have filed a Human Rights case against the Faire for discrimination, and the case has been accepted by The Alberta Human Rights Commission. 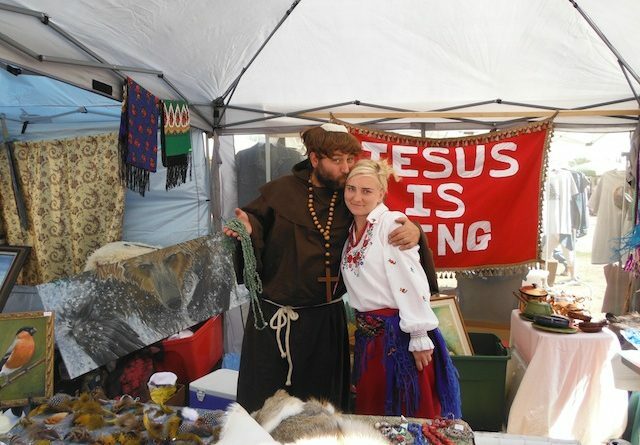 In addition to this, the Brooks Medieval Faire Society is facing a court case in the Provincial Court of Alberta for damages caused by their willful discrimination against Christians. Pawlowski is going after them. “It is time for us, the Christians to fight back against this ongoing exclusion and open harassment against all of us, simply because we are believers of Jesus Christ. After all, this country was built on the principals of our faith, the Bible and the Cross. This is our Canada not just theirs!” said Pawlowski. The Alberta Human Rights Commission accepted the complaint and is investigating it. The complaint number is S2017/01/0326. The Civil Claim was filed on January 18, 2017, in the Provincial Court of Alberta and the action number is PI790100290. “I am shocked at the level of hatred and hostility towards our way of life this days. Our faith is being mocked on television, radio, and papers. The name of our God is being slandered and ridiculed. Those that should protect us are using their state given power to hurt us and muzzle us by creating fear and laws that are designed to silence our faith in the public square and that is unacceptable.” Stated Artur Pawlowski. Brooks Medieval Faire Society has 30 days to respond to the allegations. “I believe that if every Christian would not put up with this kind of discrimination against our faith and our God and did something about it the thugs would get a clear message. Do not mess with us or it will cost you. We will no longer tolerate such an uncivilized and evil behavior. This is also our country, we have our rights! We will fight back!” Concluded Artur Pawlowski. All the documents pertaining to the human rights complaint and the Civil Claim in the Provincial Court of Alberta can be viewed by contacting Artur Pawlowski of Street Church Ministries at 403-607-4434 or via e-mail at art@streetchurch.ca.